Tourism Promotions Board Chief Operating Officer Cesar Montano recently honored ten Filipino directors and their films that were shown in 2016 and 2017 which showcased the beauty of the Philippines and have helped promote local tourism through movies. 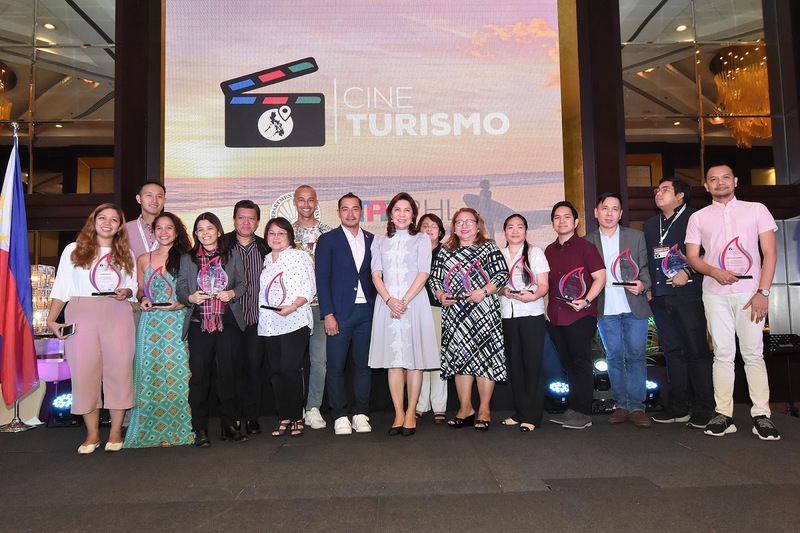 Aside from the veteran actor, Department of Tourism (DOT) Secretary Wanda Teo and other DOT officials were present at the conferment of recognitions for the films of #CineTurismo at the Diamond Hotel in Manila last week. 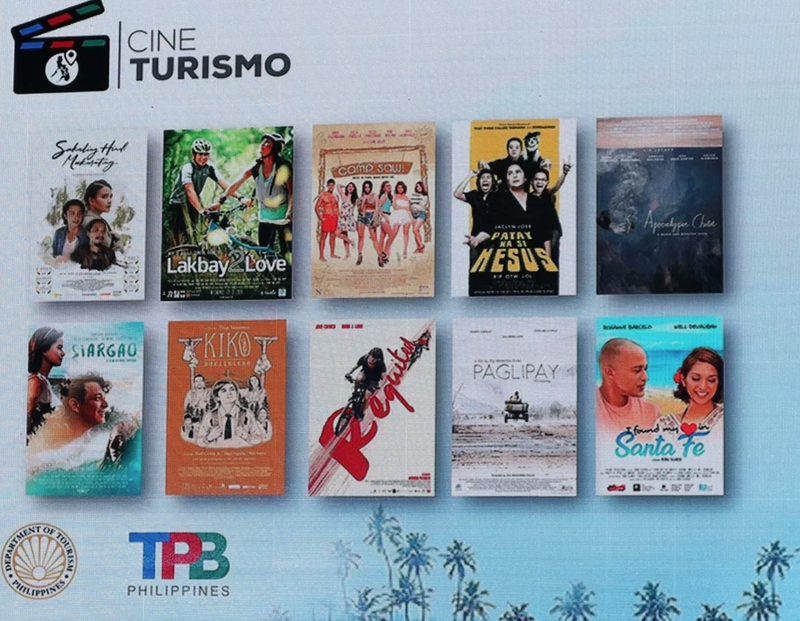 CineTurismo is an initiative of the Tourism Promotions Board Philippines to highlight films that have featured the country's picturesque and most loved destinations. Movies honored are (1)"Sakaling Hindi Makarating", directed by Ice Idanan and shot in Ilocos, Siquijor, Batanes, and Zamboanga; Direct Ellen Ongkeko-Marfil’s (2)"Lakbay2Love", which showcases Timberland Heights and Benguet; (3)"Camp Sawi" by Director Irene Villamor, set in Bantayan Island; (4)"Patay na si Hesus", directed by Victor Villanueva; Director Mario Cornejo’s (5)"Apocalypse Child", set in Baler; (6)"Siargao" by Direct Paul Soriano, which showcases the island of the same name; (7)"Requited" by Director Nerrisa Picadizo, which features Mt. Pinatubo; Director Thop Nazareno’s (8)"Kiko Boksingero", filmed in Baguio, (9)“Paglipay” by Zig Dulay and set in the mountains of Zambales and (10) “I Found My Heart in Santa Fe” by Bona Fajardo which was set in Santa Fe in Cebu. Honorees have been chosen based on atleast 9 criterias. “Film tourism is a steadily growing industry in the country. This project is created to acknowledge the many films and filmmakers that, through their wonderful portrayals of the Philippines, have aroused interest and boosted tourism in local tourist spots”, says Cesar Montano. CineTurismo awardees and DOT & TPB officials come together for a photo (from left) Aimee Bertulfo, Lakbay2Love; Patrick Ostrea, Executive Producer of Sakaling Hindi Makarating;Ice Idanan (Director), Sakaling Hindi Makarating; Requited Director Nerissa Picadizo; Rico Gonzales of Patay na si Hesus; Susan Episcope, Camp Sawi; Actor Will Devaughn, I Found My Heart in Santa Fe; TPB COO Cesar Montano; DOT Sec. Wanda Teo; I Found My Heart in Santa Fe Producer Lyn Fajardo; TPB officer-in-charge Maricon Ebron; Hilda Yaneza, Apocalypse Child; Director Thop Nazareno, Kiko Boksingero; Bona Fajardo, Director of I Found My Heart in Santa Fe; RC Delos Reyes, Siargao; and Johndel Tacata, Patay na si Hesus. Special citations were also given to South Korean films Mango Tree, directed by Lee Soo-Sung shot in Cebu, and Romantic Island, directed by Cheol-Woo Kang which was shot in Boracay. These films shows that a strong story and solid cast are not the only factors that make a great film – it also takes the perfect setting to make a great impact. Some of the most recent and best films from local filmmakers showcase the Philippines’ most stunning sights as an effective backdrop, and even as beautiful centerpiece to their stories that captivate viewers and invite them to experience the places for themselves. Aside from honoring these films, TPB is also in full support with the pending Film Tourism Bill (SB 1330) sponsored by Sen. Grace Poe and introduced by Sen. Sonny Angara, which recognizes the “potential of international and local motion picture production to create jobs, grow the economy, and raise the nation’s international profile”, and seeks to offer incentives to production companies who choose to showcase Philippine destinations and the nation’s historical and cultural heritage, or champion Filipino film practitioners and artists in foreign productions. The gathering was attended by DOT officials and the media. You may view more photos from the event here.